As the Boy Scouts say, always be prepared—and never be without a bottle opener again. Okay, so boy scouts shouldn’t be drinking, but the motto stays true. 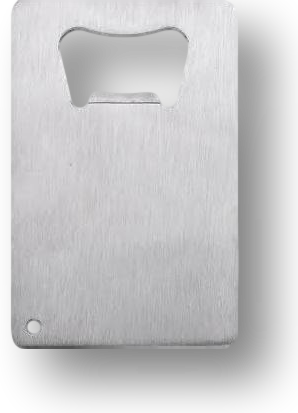 Approximately the size of a credit card, this high-grade stainless steel bottle opener easily fits into a pocket or wallet and ensures you’re never without an open bottle of beer again. With many available options for personalization, this stainless steel credit card bottle opener makes a great gift, from wedding favors to corporate gifts to clients or staff.